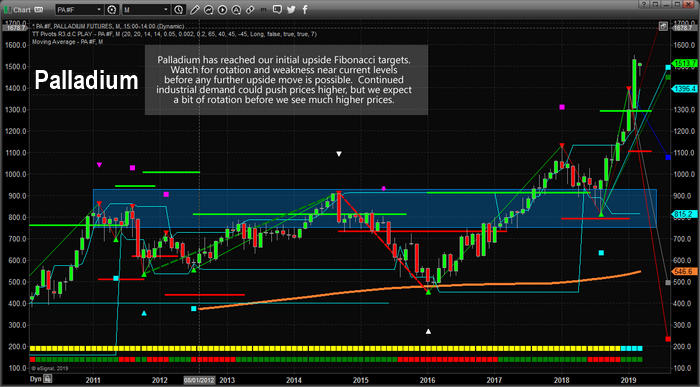 Countdown to The Precious Metals Breakout Rally – Technical Traders Ltd. 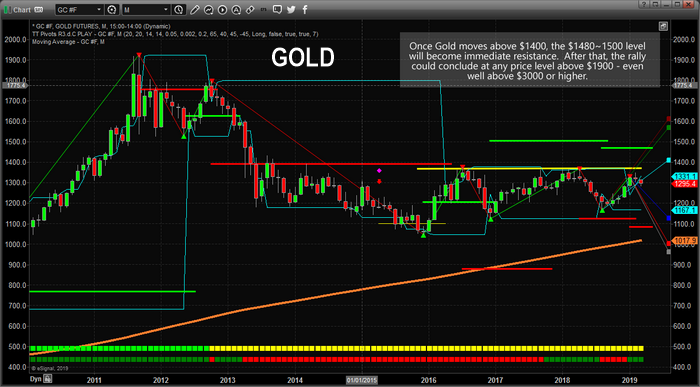 This Monthly Gold chart, below, shows you the historic peaks that make up a current resistance level near 1370. This level is critical in understanding how the momentum base and following breakout will occur. This resistance level must be broken before the upside rally can continue above $1400, then $1500. Ultimately, the momentum base we are expecting for form before April 21 is the “last base” to setup before a much bigger upside price move takes place. In other words, pay attention over the next 30 days before this move happens. 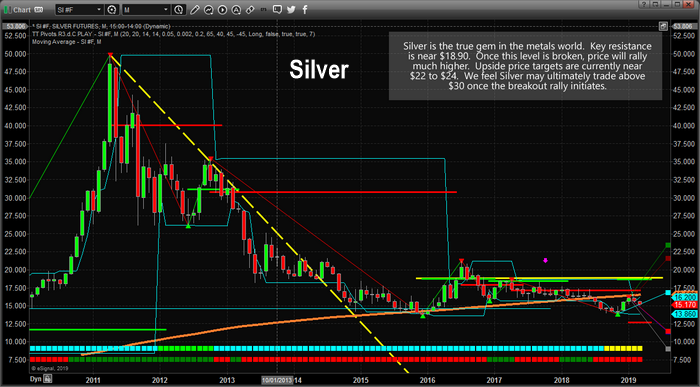 This next Monthly Silver chart is the real gem of the precious metals world. The upside potential for Silver is actually much bigger than Gold currently. Any breakout move will likely see Silver push well above $30 per ounce and we just need to watch the $18.90 level for signs the breakout is beginning. Silver will follow a similar basing patter as Gold. We expect only about 30 days of buying opportunity left before this basing pattern is completed. Again, watch the April 21 date as the key date for the breakout move to begin. Please consider the research we are presenting to you today. Our predictive modeling systems have been calling the metals markets quite accurately over the past 14+ months. If our prediction of a momentum base on or near April 21 is correct, then we should begin to see an incredible upside price swing in Gold and Silver shortly after this date. You won’t want to miss this one – trust us. There will be time to catch this move when it starts – it could be an extended upside move. Pay attention and put April 21 on your calendar now. If you like our research and our level of insight into the markets, then take a minute to visit our site to learn how we help our clients find and execute for success. We’ve been calling these market moves almost perfectly over the past 18+ months. Learn how our research team can help you stay ahead of these swings in price and find new opportunities for skilled traders. Take a minute to see how we can help you find and execute better trades by visiting www.TheTechnicalTraders.com today.